A few years ago, Richard Chan's mother had a stroke and became physically disabled. She was living in England, while he was in Norway. After the stroke, it became difficult to communicate by phone. On one occasion she fell, and lay helpless for several hours, unable to call for help. Chan, who is a telecommunications engineer, began to wonder if there was a type of phone that could make communication easier and also make the lives of its users safer. Since he couldn't find anything on the market, he began to work on developing a new product himself. In summer 2015, he contacted SINTEF to find out whether they might be interested in conducting a user study of the concept. "Chan's proposal immediately captured our interest, because it was a great welfare technology system", says researcher Hanne Opsahl Austad of SINTEF ICT. 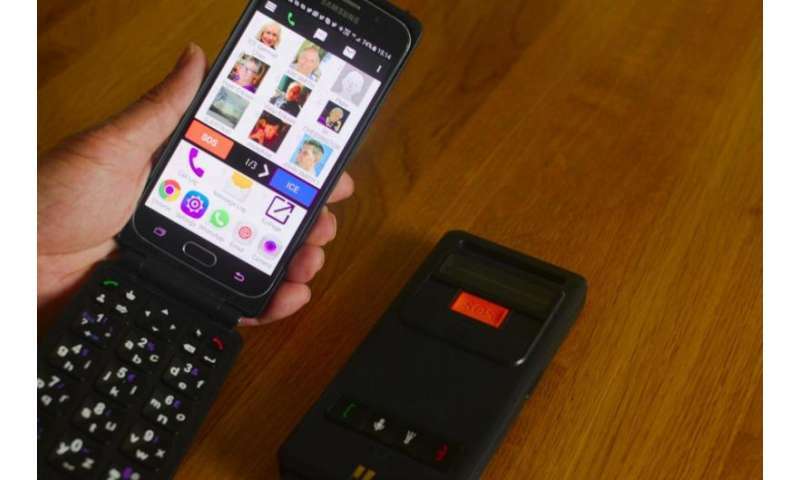 The project received funding via the Norwegian Regional Research Fund system, and one year after the EziSmart project was launched, Project Manager Austad has a new system that has been tested by numerous users, most of them elderly, but also blind people and Parkinson's sufferers. Austad shows me the EziSmart, which in practical terms is a phone case fitted with physical buttons. The plan is for the case to be suitable for a variety of Android smartphones, but at the moment it is only available for the Samsung S6, A3 and S4. The buttons are ergonomically designed in the shape of small saucers, which makes them easier to use, even for people who may have trembling hands or trouble with fine motor skills. "One person in the user group has Parkinson's, and finds it really easy to type messages on the EziSmart", says Austad. People who have minor problems with fine motor skills also enjoyed using the case. Austad explained that one of the users, who had been using a standard smartphone, was extremely happy to switch to the EziSmart, because he no longer gets locked out of his mobile banking after mistyping the password. Reidun Gully (70) has been testing the EziSmart for two months now. She is part of the user group, and has invited Project Manager Austad and the inventor Chan to her home in Roa. "Before I started using this, I had an ordinary mobile phone. As an older person, when you start using a smartphone, you already feel quite clumsy. Being able to use a physical keyboard felt more familiar and simpler", says Gully, sitting on her sofa, typing a text message to a friend. Gully is a physiotherapist, and has worked with stroke victims and people with neurological illnesses, so she knows how difficult it is for these people to use smartphones. A touchscreen keyboard is not suitable for everyone. Gully also really likes the extended GPS function, one of the applications Chan has developed for the EziSmart. She explains that if she is out for a walk, her husband can send a text message and will then receive an automatic reply containing a link showing him where she is on a map. She can also easily send her position herself via a message, or trigger an SOS alarm that both sends her position and phones pre-selected contacts with the speaker activated. "I really enjoy walking in rugged terrain, and these functions give me extra safety and freedom", says Gully. ICE (In Case of Emergency) is another application that Chan has developed. Users can easily enter important information into the ICE app, such as insurance information and which medicines they're taking. You can take a photo of the medicines, which will then be entered. SOS and ICE are both easily accessible with the large buttons. "We have also found that all the users in the project have derived great enjoyment from the benefits offered by smartphones, and have started to use many applications like the camera, weather forecast, map, newspapers, etc. ", says Austad. 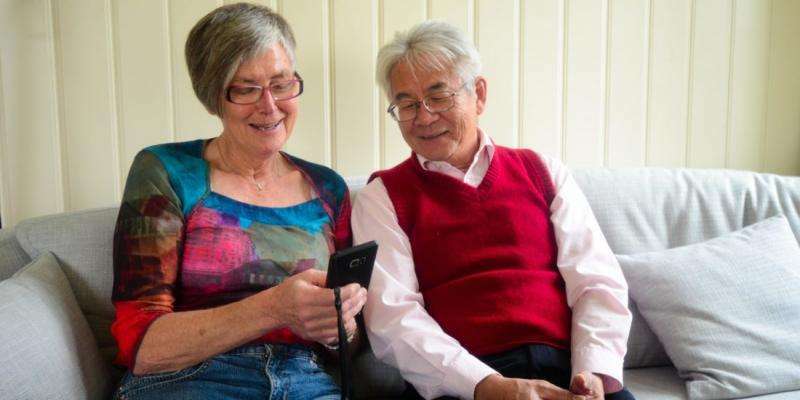 Austad has also looked at the current selection of smartphones specially designed for the elderly. "The problem is that these phones tend to lag behind the technology. Because they are products designed for a small group, they generally have poor technical specifications and have less money spent on them than standard phones. This applies to features like the camera and screen, and we've found that these are functions that are important to our test users", she says. Austad talks about her experience with the EziSmart being used by one of the people in the user group that is blind. "She likes the keyboard, and combines it with a text-to-speech app to hear what she has written. She particularly likes the option of navigating through the text with the keyboard: 'I sit and smile every time I use this function', Austad quotes her as saying. Chan contacted the Norwegian Association of the Blind's Visual Impairment and Skills Development Centre at Hurdal for their opinion, and they thought that the EziSmart could being many benefits to blind and visually impaired people. Chan has plans to develop more features that would be particularly suited to this user group. "Many people with mild disabilities have been left behind by technology. In a commercial world, this group is not interesting enough, so there has been no investment in developing products for them. That triggered something in me", says Chan. "It's about giving people the chance to use the same platforms as everyone else. A smartphone makes it easier for people to communicate with the outside world and enhances their quality of life", adds Austad.